The Frucosol F-50A Automatic Juicer comes with all of the same fantastic features as the F-50, but it also includes and automatic feeder on the top of the juicer. 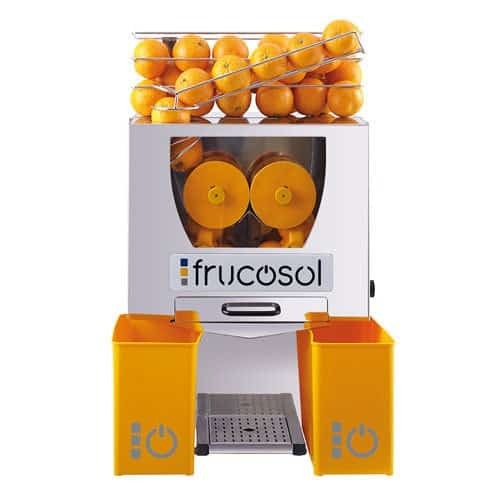 The Frucosol F-50A extracts fresh-squeezed juice from citrus fruits quickly and quietly. The beauty of the Frucosol F-50A lies in its simplicity. Simply load the fruit into the automatic feeder on top of the machine, press a button, and watch the juice come out of the bottom into a glass or pitcher. The peels are automatically discarded into separate bins. The Frucosol F-50 Automatic Juicer comes from Spain and is very popular in the small cafes and coffee shops of southern Europe. The European design is simple and elegant, and having few moving parts means the juicer is more dependable than most. The gentle squeezing process means less bitter compounds in the juice. One button starts and stops the juicing process, and fruits automatically load from the holding bin on the top of the juicer. Peels automatically fall in the two orange bins. The juicing process is fun to watch, and customers will enjoy the display. 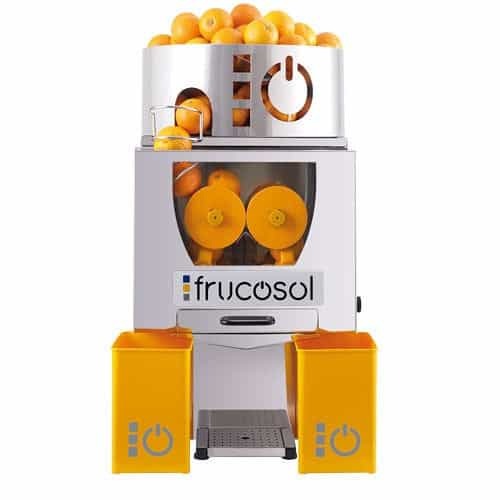 The Frucosol F-50A Automatic Juicer works for oranges, lemons, limes, and grapefruits up to 3.1 inches in diameter. 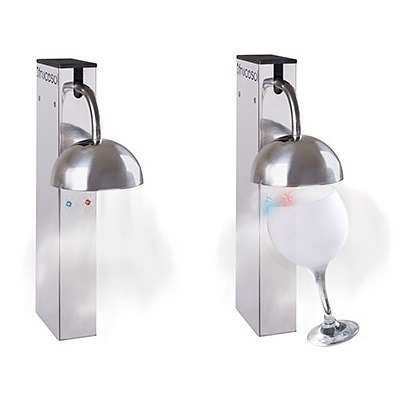 It can squeeze juice from 20-25 fruits per minute. An automatic shut-off sensor prevents accidents.